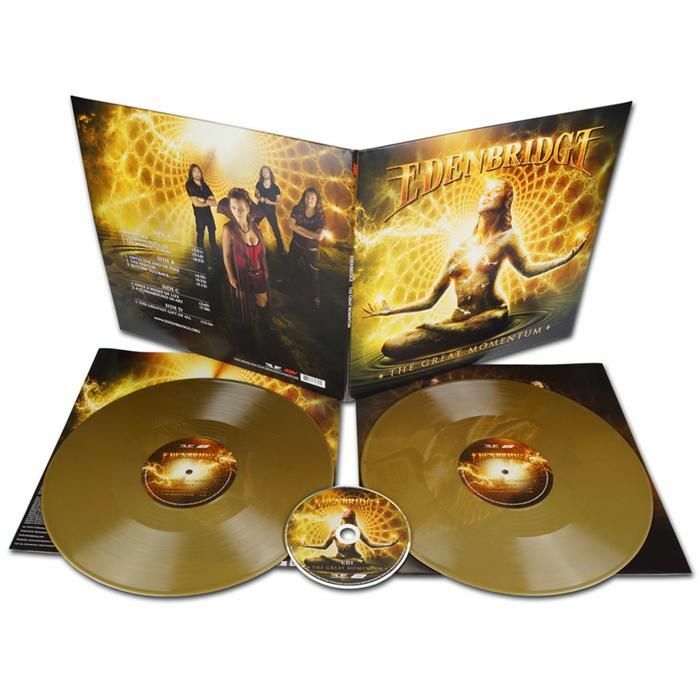 EDENBRIDGE - THE GREAT MOMENTUM GOLD VINYL (2LP+CD) | Online Shop | Wizard LTD. Album: "THE GREAT MOMENTUM GOLD VINYL (2LP+CD)"
Any band wanting to leave their mark in our fast-lived world needs first and foremost two things: compositional substance and consistency. After all there are plenty of one-hit wonders in this industry, those overnight sensations with their artificial fast food-like products that frequently don’t even have the shelf-life of fresh fruit and veg. Edenbridge, on the other hand, have already proved their great musical potential, eight studio albums since their debut in 2000, in addition to a number of live recordings, DVDs and compilations speaking for themselves. Having said that, it’s surprising that the Austrian band surrounding vocalist Sabine Edelsbacher have once again succeeded in raising the bar for symphonic melodic metal even further with their latest album The Great Momentum. Composer and multi-instrumentalist Lanvall has produced another offering that’s ambitioned in every respect and will without a doubt go down in the band’s history as their toughest release to date. As its predecessors The Grand Design (2006), Myearthdream (2008), Solitaire (2010) and The Bonding (2013), The Great Momentum was again mixed by Karl Groom (Threshold) at his Thin Ice Studio in Surrey, England. The mastering was taken care of by Mika Jussila (Stratovarius, among others) at the renowned Finnvox Studios. Among the guests featuring on the album are vocalist Erik Martensson (Eclipse, W.E.T, Nordic Union) and the Junge Philharmonie Freistadt orchestra. A real eye-catcher is the atmospheric cover artwork, a joint production by the American artist Anthony Clarkson (Geoff Tate, Fear Factory, among others) and Edenbridge drummer Johannes Jungreithmeier. “This atmospheric blend of elegance and energy is the ultimate symbol of the music on The Great Momentum,“ rejoice Edenbridge, who are set to experience the next highlight only a few days after the release of their album on 17 February 2017: the group will embark on their second tour of Vietnam in March 2017. Along with two concerts in Hanoi and Ho Chi Minh City (the former Saigon), an 80-minute show will be recorded for Vietnamese TV as the tour’s climax. That’s when everything will be about enjoying that great moment to the full, in line with the new album’s motto.